Beth Roberts got started in fitness while living at the beach in California in her 20s. Originally from New England, Beth missed the seasons, so she moved back to the East Coast in 2000. Working on Cape Cod in the restaurant business, she also taught fitness full-time until settling into a management position at a local restaurant and putting her dreams on hold. It only took six years to realize this wasn’t the lifestyle for Beth. The avid skier, who often spent weekends in nearby Vermont, took both the literal and proverbial plunge when she moved to Killington. During her first season, she tended bar full time and skied every day of the winter. Living in this active community, she realized fitness was her true passion, so she jumped right in and never looked back. As she ventured into the business that would become Killington Bootcamp, she supplemented her income with bartending, offering ridiculously cheap personal training sessions and free weeks of boot camp while she got established. She taught her classes in local fields and courts, and rented space in yoga studios and gyms. She drove to neighboring towns up to 40 minutes away to get her name out there, hoping her business would survive. She even had the foresight to start a retail line featuring her logo to create more awareness in the area. Her hard work paid off, and by March of 2014, Beth felt she was busy enough to take the business full-time. She worked her final bar shift that spring, then expanded her summer boot camp schedule and opened a fitness studio on the Access Road that December, where she now enjoys a year-round home base. But that doesn’t mean you’ll be stuck in the studio. Beth still holds her outdoor classes on recreational fields, and on the mountain itself. What exactly is ‘boot camp,’ you ask? According to Beth, boot camp is unique in that it combines a variety of drills that participants most likely wouldn’t do on their own. For example, in outdoor classes, you might flip tires, slam battle ropes or run partner drills through agility ladder and cone courses. You could even play games to push yourself through more burpees, push-ups, hill sprints and squat leaps than anyone actually wants to do. The group energy is contagious, and while it’s a competitive spirit, everyone is supportive and encouraging to all levels – from the casual beginner to the Elite level racers. Although ‘boot camp’ may sound intimidating, everyone can work together at their own pace. Once Beth realized many of her clients were interested in training for specific events, such as races, she decided to start her own race series. Today, she hosts three races throughout the year, and plans to expand soon. Killington Mountain Lodge is a proud sponsor of ‘Race to the Peak,’ a challenging and unique one-way 5K up the trails to Vermont’s second highest peak. The course winds up the mountain from Killington’s Snowshed base lodge to the Peak Lodge, ending at the ‘Stairway to Heaven’ – what locals call the final 200 steps. A DJ waits at the top, calling out racer names as they approach and playing motivational music. With entry, racers receive a gondola ticket for their descent to the base. 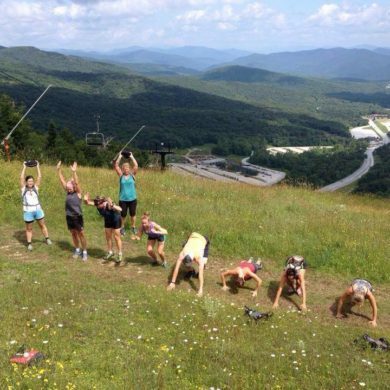 Killington Boot Camp was founded on the mission to improve overall health, self-esteem and quality of life, while getting more people outside to explore the mountain’s ‘backyard,’ an intense outdoor training ground. Get ready to explore new territory when you sign up for your boot camp today. The Killington Boot Camp Studio is located at 2910 Killington Road in Killington VT. For more information, please visit the Killington Boot Camp website or call (802) 779-4619.